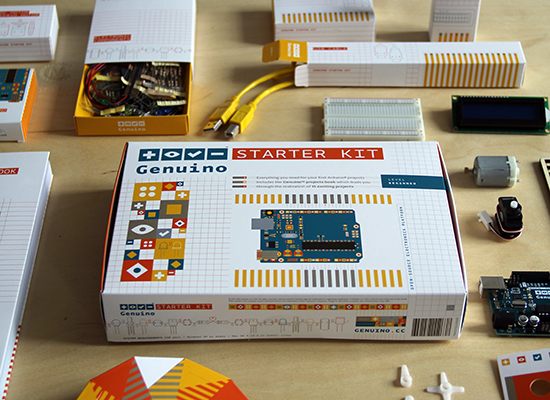 Starter Kits now available in Spanish and German! 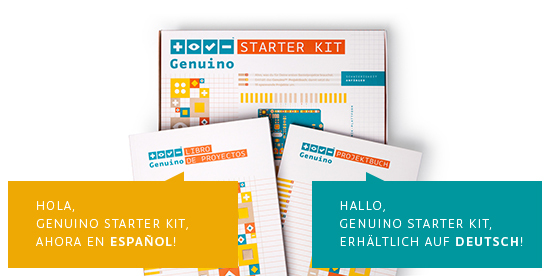 Today, we’re excited to announce the availability of the Genuino Starter Kits in both German and Spanish–now on our online store (outside of the US)! 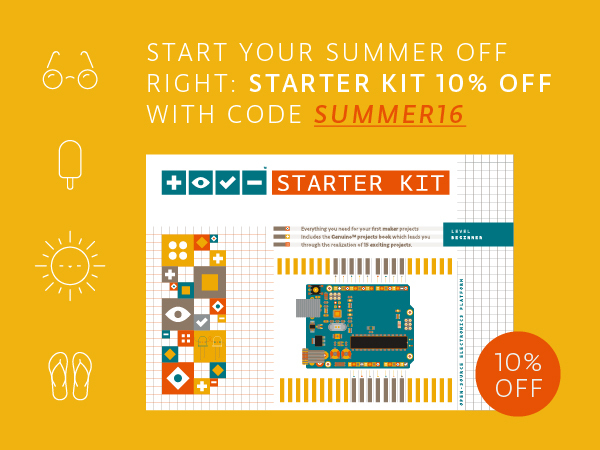 What’s more, you can take advantage of our ongoing promotion and save 10% on your kit throughout the entire month of July using the code below! Each box consists of an Uno board, 150 components, and a Projects Book which provides step-by-step instructions for 15 different creations. Most of these projects also come with cardboard cutouts to make your projects even more fun. 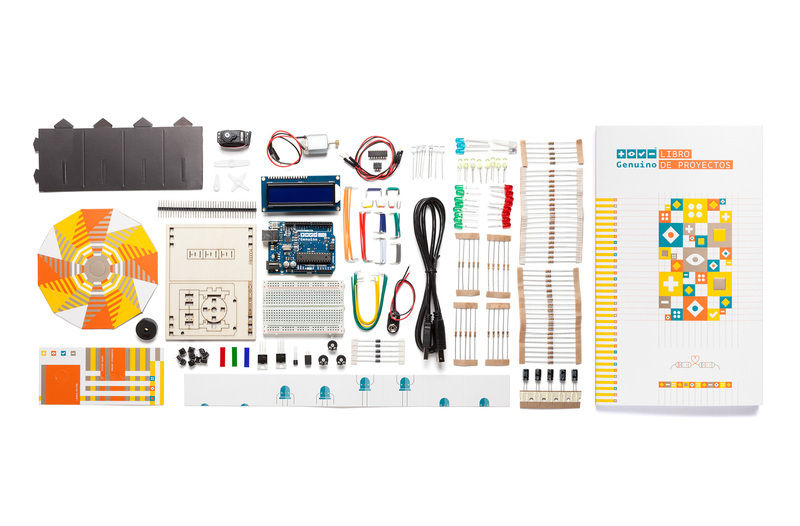 The kit will help you control the physical world with sensor and actuators, as you make your way from the basics of electronics to more complex gadgets. Projects include musical instruments, a temperature-sensing Love-O-Meter, a spaceship interface panel, a motorized pinwheel, and a magic crystal ball that answers all your questions. For the first month, the German version of the Starter Kit is also exclusively on Watterott store, our board manufacturer! Congratulations to Geoff Seawright for the following photo showing a cute dog getting angry with four-legged Arduino spider. 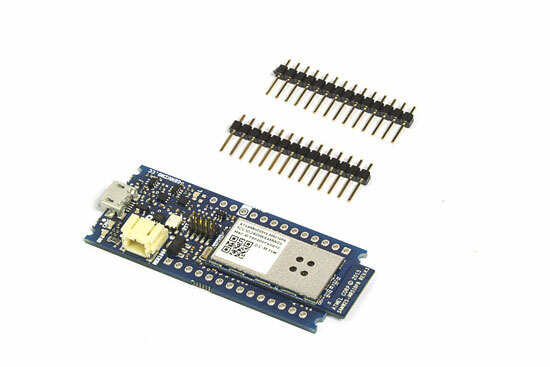 He’s the last winner of our MKR1000 giveaway, which kicked off back on Arduino Day! 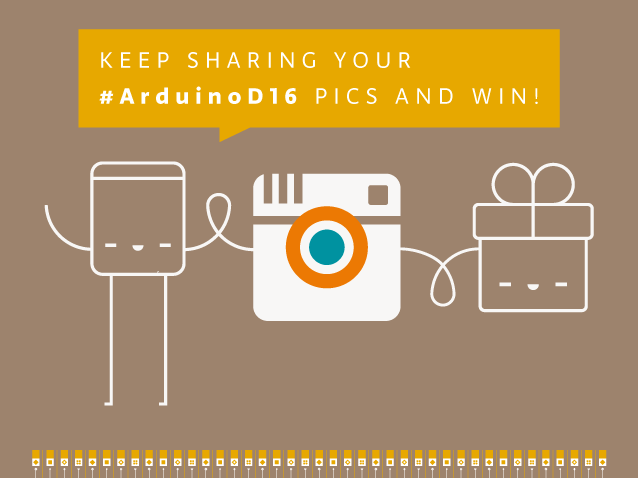 Thanks to all the participants sharing their pics and mentioning our new official Arduino Instagram account! This weeks ’s Instagram winner hails from Indonesia! Genuino Day 2016 in Indonesia was organized by the local community, who submitted this winning photo of the group on Instagram. For sharing the pic below, they’ll be receiving a Genuino MKR1000 and a Genuino Mug! Remember to also share cool photos relating to your favorite Arduino and Genuino moments in your community beyond Arduino and Genuino Day. Show us your local activities! Congratulations to Gustavo Reynaga from Sinaloa (Mexico) for the following picture taken at Genuino Day at Mazatlan International Center. We’re sending him a Genuino MKR1000 and a Genuino Mug! It’s your time to win a MKR1000 too! – Every thursday, from April 7th to May 26th we are going to choose one of your pics (posted starting April 2nd) and announce on this blog a winner of an Arduino or a Genuino MKR1000 and one of our t-shirt or mug for a total of of 8 lucky people. Easy enough, right? Remember to share cool pictures regarding Arduino and Genuino moments in your community also beyond Arduino and Genuino Day. Today’s Giveaway winner on Instagram is from Manila! Here we are today announcing the winner of this week for our Instagram giveaway! Congratulations to Thinklab.ph from Manila (Philippines) for the following picture taken at Genuino Day with Rizal High School showcasing an Arduino based battle robot: Tagisang Robotics, Salamander. They win a Genuino MKR1000 and a Genuino Mug! We’re happy to announce the second winner of the Instagram giveaway! Congratulations to Emmanuel Ani from Accra (Ghana) for the following picture taken at Genuino Day organized together with Mark Acquaisie Antwi, Andrew Kattenstroth, Atitsogbui Patrick Keli, Selorm Atsatsa, Humphery Batierah, Akati Micah . He wins a Genuino MKR1000 and a Genuino Mug! We’re happy to announce the first winner of the Instagram giveaway we launched last week! Congratulations to Gedeane Kenshima from Rio de Janeiro for the following pic taken at Genuino Day in Rio organized by Cefet/RJ and showing an amazing Tesla coil. She gets a Genuino MKR1000 and a Genuino Mug! Do you want to have the chance to win too? Remember to share cool pictures regarding Arduino and Genuino cool moments in your community beyond Arduino and Genuino Day! We’re looking forward to see your pics. April 2nd was a great day. We spent it celebrating Arduino and Genuino Day in more than 330 local communities and we had lots of fun! Our social channels were full of mentions from pics and messages about the events and all the activities you organized or took part to worldwide. That’s why we want to keep celebrating and have some of you win goodies. Now we are launching a giveaway on Instagram and you’re invited to participate! How does it work? We’re looking forward to see your pics!